CTI News & Updates - COMPUTER TEAM, INC.
Find the latest news & updates from COMPUTER TEAM shown newest to oldest. Apple is the first publicly traded trillion-dollar company 08/02/2018 and our founder was there at the beginning! August 2, 2018, Apple has become the world’s first publicly traded company valued at $1 trillion, that is $1,000,000,000,000.00. See the photo below taken in 1984 at the Apple roll out of the Apple IIc and our founder Dave Smith was at that roll out in San Francisco. This article was published in the QCTIMES 08/03/18 qctimes.com. 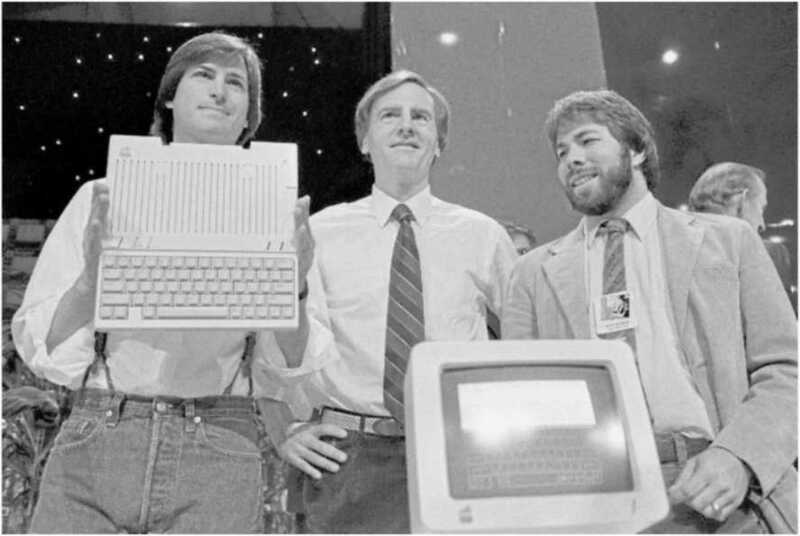 In this April 24, 1984, file photo, Steve Jobs, left, chairman of Apple Computers, John Sculley, center, president and CEO, and Steve Wozniak, co-founder of Apple, unveil the new Apple lie computer in San Francisco, Calif.
SAN FRANCISCO - Apple has become the world’s first publicly traded company to be valued at $1 trillion, the financial fruit of stylish technology that has redefined what we expect from our gadgets. To survive, Apple brought back its once-exiledco-founder, Steve Jobs, as interim CEO and turned to its archrival Microsoft for a $150 million cash infusion to help pay its bills. Apple hit the $1 trillion mark when its shares reached $207.04 around midday in New York. Apple shares closed with a gain of 2.9 percent to $207.39. The shares are up 23 percent so far this year. Another company, Saudi Arabian Oil Co. could eclipse Apple if it goes through with plans for an initial public offering. Saudi officials have said the IPO would value Saudi Aramco, as the company is often called, at about $2 trillion. But until the IPO is completed, Saudi Aram-co’s actual value remains murky. Jobs’ vision, showmanship, and sense of style propelled Apple’s comeback. But it might not have happened if he hadn’t evolved into a more mature leader after his exit from the company in 1985. His ignominious departure came after losing a power struggle with John Sculley, a former Pepsico executive whom he recruited to become Apple’s CEO in 1983 — seven years after he and his geeky friend Steve Wozniak teamed up to start the company with the administrative help of Ronald Wayne. Happy 30th Birthday to Computer Team! July 1, 2017, Computer Team turned 30 years old. It really doesn't feel much older than 29 though. My staff and wife surprised me with a party at lunch today. I am very grateful for these relationships. Our long-lost programmer from Minneapolis and his lovely girlfriend even came down to help celebrate. Below you will see from left to right Wayne Swank Maintenance, Mike Belville Programming, Dave Belville Systems Engineer, Kyle Knott Support Specialist, Bev Smith Office Manager, Dennis Mote Systems Engineer, Dave Smith President, and Aimee Fagan Administrative Assistant. Our best team ever! Then there is my award for being here the whole 30 years! Our Road is Finally Opened! You can now get to Computer Team, Inc. the same you have done it for the past 29 years. As many of you know our road to our offices were closed the day after Labor Day. Please get to our office the same way as in the past. Thank you to everyone that made the effort to get here during the construction in preparation for the new I-74 bridge. Thank you to all the construction workers for trying to speed this process along as fast as possible. 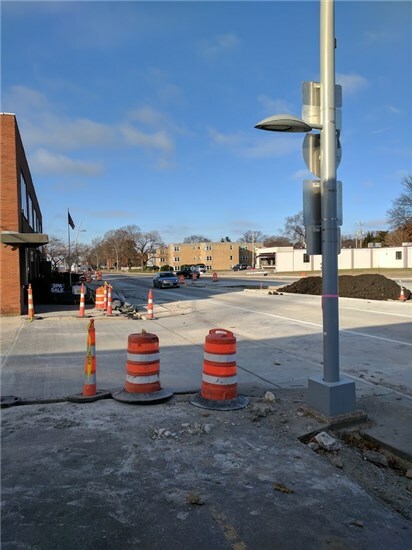 Stay in the left most lane and proceed to 10th Street, turn left onto 10th Street proceed to State Street, turn left on State Street and keep to the right and proceed to our new driveway. Stay in the right lane and veer off to State Street just after 10th Street to our new driveway. We are looking forward to seeing our customers soon. In July, Avast signed and announced an agreement to acquire AVG Technologies. We are excited to inform you of the closing of the acquisition. We are now formally part of the ‘Avast family’. By combining the strengths of AVG and Avast under one company, we are even better positioned to address SMB (Small and Medium Business) security needs moving forward. We are taking the combined product capabilities of both companies, developing an even more powerful, integrated security portfolio. Avast is fully committed to our AVG Partners and customers towards our mutual success. Whether you use an AVG or an Avast product, you can be reassured of our continued support to help you achieve addressing the security needs. We will keep you updated on any changes as they occur. We see this as a great move because both companies have always been highly rated. There is a windows 10 upgrade going around that removes the Classic Start menu that we have provided to most of our clients. The Classic Start menu makes your computer look like Windows 7 or Windows XP which makes it easier for you to use it. If you have had this issue just use the link provided here to update your system back to Classic Start. If you need further assistance with other issues after this update, please contact our helpdesk. Hello everyone, this one is important. There is a new rransomwarevirus hitting now that may be harder than ever to recover from. We have produced a PDF that documents the steps you should take to protect yourself and your companies from attack. What happens when infected with Jigsaw? Hello everyone, we are updating our remote connection solution. OK, so what is a remote connection solution for and why should I care? Our clients and we use remote connectivity solutions to connect to their computers, laptops, tablets, and mobile phones from remote locations. This allows access to files, programs, and the complete desktops from anywhere you have an Internet connection. This allows us to offer remote support in a quick an efficient manner. This saves all of us time and money. For years now, we have been able to save clients thousands of dollars in support cost by not having to travel to each location to provide support. For some years, we now we used LOGMEIN to provide this solution. While not completely satisfied with this solution the cost was reasonable. Because of the past pricing, we were able to offer our clients the remote access program without additional cost to them. Unfortunately, LOGMEIN has made changes to their program this year and raised the prices by a factor of about 10 thus forcing us to charge our clients a large fee to stay with LOGMEIN. We then started our search for another solution that would at help control price increases for both our clients and us. We found that our reseller association The ASCII Group had made a deal with a new product coming to the US from Canada and Europe called BeAnywhere. As it turns out BeAnywhere offers many more features than LOGEMIN at about ¼ of the price. It is still more expensive than the old LOGMEIN program but still a lot most cost effective. We will have to charge clients for access to their computers remotely if they need that type of access. However, it is only going to cost $10.00 Per Year per User. If we stayed with LOGMEIN, it would have cost about $100.00 per year. If you have any questions or need remote access to your systems please let us know in case we may have missed someone. End users who want to use Microsoft Outlook as their preferred email client can do so when Outlook Connector for MDaemon is deployed. Outlook Connector provides groupware and collaboration functionality by connecting the MDaemon email server with the Outlook client to use Outlook's email, calendar with free/busy scheduling, address book, distribution lists, tasks, and notes. Many MDaemon deployments utilize a mix of MDaemon's WorldClient for web-based email access and Outlook, depending on user preference. To ensure that Outlook Connector for MDaemon has optimal performance, please review and consider these guidelines before deployment. This morning between 7:30 AM and 8:15 AM, Computer Team suffered an internet service outage as a result of a fiber-optic line getting damaged between our facility and our internet provider. We applogize for any inconvenience this may have caused. If you are still having trouble utilizing our services, please don't hesitate to reach out to our help desk at 563-355-0426 or 800-355-0450. We are currently in the process of switching to a new phone system. Our main phone number (563-355-0426) and our Toll-Free number (800-355-0450) will continue to work with out any problems. If you are dialing any of our other phone numbers, we ask that you update our contact number to be one of the above numbers so that you get in touch with us when you need to. Still Using Windows XP? Need to upgrade to Windows 7? Is your place of business still using computers with Windows XP? If so, you should think about getting those computers upgraded before April 8th, 2014. Why? Well, on that date, Microsoft will end all support for XP & it will not be receiving any more updates… ever. This means that the computer will be more prone to getting viruses or infections. Also, if your business is required to hold any form of compliance, you will be in violation come April 8th. It’s not too late to take a pro-active approach to getting your business upgraded! Here at Computer Team, we have done some of the work for you. We have an abundant supply of Windows 7 desktop computers for only $199 you can get a refurbished desktop computer with a 12-month warranty. Need quite a few? No problem, get in touch with us for bulk pricing! Cougar Mountain is getting ready to release Denali Payroll! I can't believe it either. Denali Payroll is built for speed. You’ll probably notice this speed the most when you process payroll. For example, consider a normal bi-weekly payroll run for a business with 10 employees. 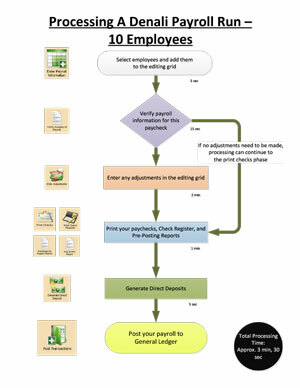 As illustrated below, the CMS Professional process requires over 60 individual steps, while the same payroll process requires only 3 steps in Denali. That means more than 57 individual steps are eliminated, and the number of steps is reduced by over 90%. From a time perspective, the CMS Professional process takes 13 minutes, which is nearly 4 times as long as the 3 minutes it takes to complete the same process in Denali. 57 fewer steps. 10 fewer minutes. 90% fewer chances to make errors. We apologize for the short outage of the email server this morning. We were under attack from a spammer and had to shut down and block the attack to prevent it from taking the server down completely. All statuses are normal now and well continue to monitor in case they attempt another attack. If you have any questions please contact Dave Smith or Dave Belville. Posted 07/15/2013 10:00 amNew Computer Team Integrated Scales Systems for Cougar Mountain & Others! Posted 06/25/2013 8:43 am New Computer Team Email Server Features! Attachment Linking is a feature that makes it possible for MDaemon to remove all attachments from incoming email messages, store them in a designated location, and then place URL links to the files in each message from which they are extracted. The recipients can then click those links to download the files. Beginning with MDaemon 13.5, attachment linking is now supported for outbound messages. Attachment Linking enabled on a per-user or domain basis on client-by-client request. When the user sends an email, Attachment Linking will extract the file, store it, and replace it with a URL that you can customize. Another new option allows you to specify a minimum size extraction. Using this, you can configure MDaemon to ignore small attachments and only pull out larger ones. I have already configured groups and rules to add this feature to any of clients email accounts. Currently the rule states that any attachment that 5MB or large will be linked rather than sent with the email. This avoids the attachment limits of most email servers. This new feature is now active for the following clients: QCA Spas, Inc. and Petersen Plumbing. Cougar Mountain Releases Denali Service Pack 12! Cougar Mountain Releases Denali Service Pack 11! Email Server Back to Full Power! COMPUTER TEAM, INC. has corrected the partial email server failure from this morning.We are reviewing changes to the mail servers to see if we can improve the response time to any future issues like the ones that occurred today. Again we apologize and any inconvenience this caused. Email Server Hard Drive Sub System Failure 6:14 am Today! COMPUTER TEAM, INC. has had a partial email server failure this morning at 6:14 am. While the server is running this error has caused the server to slow down. Currently it is having issues keeping up with the normal volume of email. We are going to bring it down to fix the problem. No email will be lost because outside servers configure properly will continue to retry sending. We hope to have it back up and running with the hour. We apologize for any inconvenience this will cause. COMPUTER TEAM, INC. is about to make some major changes to the way we handle spam email. For years now, COMPUTER TEAM, INC. has filtered your e-mail for spam messages. As some of you may know, we sometimes get false positives. A false positive is an e-mail marked as spam but is not spam. We then spend considerable time searching through our logs and history to find those false positives to ensure our clients get the e-mail they are expecting. Windows 8 is coming and you can get for only $14.99! Quickbooks may not be the best choice for accounting software anymore! The IRS can demand Quickbooks & Peachtree data files! Go to a command prompt. This is done by selecting start then run and typing CMD. 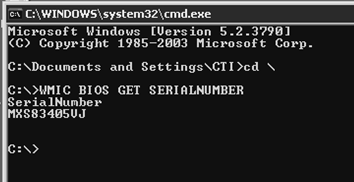 Once at the command prompt type the following: WMIC BIOS GET SERIALNUMBER and hit the enter key. If your computer's serial number is documented in the system BIOS, it will appear on the screen like the one below. Deep in tiger country, two people are in a cage made of millions of toothpicks. Is it enough to protect them?...See More..
For complete details on the issue and fix...Read More..
Project "Vancouver," Microsoft's new cloud-based social-analytics service, is available to testers interested in the idea of integrating social Web data into business applications...Read More..
Google has identified traffic patterns consistent with a certain malware infection, and it's letting users know that they need to take action. Read More..
One of the great myths of security is that if you're infected with malware it's your own fault, because you were visiting dangerous web sites. Read More..
Fretlight's founder Rusty Shaffer visits the CNET studio to demo a guitar that can light up the fretboard using tablature with popular songs. We learn how to play Deep Purple's Smoke on the Water and AC/DC's Thunderstruck. Read More..
Do you love your Google Voice number so much that you want to make it permanent? Well, now you can for a fee. Read More..
After a three-week IE9 immersion, I've concluded that Microsoft once again has a competitive Web browser. And even though Internet Explorer remains the most-used browser on the Net today, convincing me that Internet Explorer 9 is a real browser was quite an accomplishment. Here's why. The November issue of The CPA Technology Advisor included a review of 2010 Review of Not-For-Profit Accounting Systems, where Cougar Mountain Software received 4 ¾ stars. The review covered six criteria: Basic System Functions, Core NFP/Fund Acctg Features, Management Features, Financial Statements & Reporting, Import/Export/Integration, Help/Support, and CMS received outstanding scores in each area. Click here to read the entire review written by Mary Girsch-Bock. The November issue ALSO included an column about At-A-Glance Dashboards and CMS was also mentioned there. Click here to read "Dashboards: Business Intelligence At A Glance" by Lisa Kianoff, CPA.CITP. AccountMate Software Release Gives Clients a Competitive Advantage! (Click Here For Updated Features. AccountMate Software Corporation today announced that it is releasing AccountMate 8 for SQL and Express software which incorporates over 100 enhancements and an entirely new module. AccountMate 8 gives users added functionality such as the ability to drill down on the details in the Executive Summary Report, the ability to temporarily hold or increase customer credit limits, combine electronic payments during bank reconciliation, allocate quantity updated during work order explosion and support multi-step processing of work orders. An entirely new module, The Custom Field Manager, is also being released. This optional module allows an authorized user to add custom fields to new tabs within all the accounting modules. These fields can also be added to the database. Custom fields can be read-only or editable in select screen forms. This makes it easier to customize the software to capture additional information that the client may require, without having to modify the source code. AccountMate products are supported by a global Solution Provider Channel that can also modify the software system using optional source code. This added capability plus the functionality in AccountMate 8 for SQL and Express further allows unlimited growth and competitive advantage for the thousands of AccountMate clients. The CPA Technology Advisor awarded Cougar Mountain Software another 5-star review for in their 2010 Review of Small Business Accounting Systems. This review focused on products that are installed on users’ computers only, and cost no more than $5,500 for the core accounting system. Cougar Mountain Software was the only company to receive a perfect review. Read this 5-star review in full from CPA Technology Advisor’s April/May 2010 issue and you can find reviews for all our products on our Awards and Reviews page. Cougar Mountain Denali Version 2.9 Released! Cougar Mountain Software will release Denali 2.9, Thursday, April 22nd, 2010. At that time, your customers can download it from the Denali Full Version Installations page of the Customer Service Center site. Due to the size of the application as a result of the additional new features, beginning with this version, Denali will be released in DVD format. Please make your customers aware of this change. 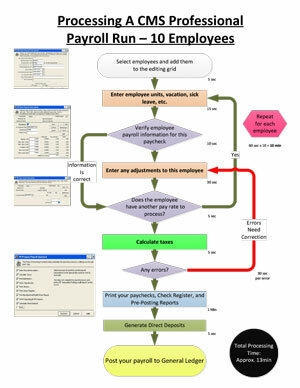 A one-window solution to import their completed AP, BR, and GL payroll transactions from any payroll service (e.g. ADP, Adecco, etc.) that matches the universal bridge format, including our CMS Professional Payroll software. Integrating payroll data into Denali has never been easier. Cougar Dtails, A Financial Dashboard.This financial dashboard provides a visual representation for your customers of their company’s financial performance. This dashboard also gives the ability to drill-down into the account specifics. The ability to print customized checks in Accounts Payable using Create-A-Check®. Enhanced General Ledger report groups. All recent improvements to the Denali software application. Get Office 2010 Free with the purchase of Office 2007! You don’t have to wait Buy Office 2007 today, get Office 2010 free* Purchase, install, and activate a qualifying Office 2007 product between March 5, 2010, and September 30, 2010, and you’ll be eligible to download Office 2010 at no additional cost. Receive an e-mail reminder when Office 2010 is available for download. For More Information Click Here! After 23 years in business, Computer Team Inc. expanded our normal business hours from 9:00am to 6:00pm to 8:00am to 6:00pm, Monday through Friday. We have discontinued our Saturday morning hours except by appointment. To schedule a Saturday appointment please click here for Computerteam contact information. Tired of slow internet connections?